A New Farm Show Tradition? BEST WISHES FOR A HAPPY AND HEALTHY 2012! Many thanks to Scott Doyle and Karen Galle from the PHMC’s Bureau for Historic Preservation for their contributions to this post. BHP staff have selected historical markers with agricultural themes (many of them directly food-related) and developed a booklet to go with them. Student detectives will answer questions in the booklet by finding repros of the markers scattered around the Farm Show Complex. Those who don’t find all the markers while at the Farm Show will be able to finish their hunt at home by visiting ExplorePAHistory.com, a website that uses historical markers as a starting point for learning about Pennsylvania history (including lesson plans for teachers). To start your scavenger hunt, visit PHMC’s Farm Show booth in the Family Living Section of the Main Hall from 9 am to 8 pm (find the butter sculpture and head east). In addition to learning about rural and agricultural life, you’ll also be able to see PHMC’s popular dugout canoe and archaeology exhibit. And just for participating in the scavenger hunt, students will receive a History Detective temporary tattoo! The 2012 Historical Marker Scavenger Hunt is sponsored by Pennsylvania Cooperative Potato Growers, Inc.; Society of Farm Women of Pennsylvania; PA Civil War 150; witf; Pennsylvania Heritage Society; and Pennsylvania Department of Agriculture, Bureau of Farm Show. You can read an electronic version of the Trailheads feature in Pennsylvania Heritage magazine here (or better yet, you can join the Pennsylvania Heritage Society and get the magazine and other membership benefits). For all of you out there looking for something to do in the coming week—between holiday celebrations and fighting with your in-laws (just kidding)—here’s a recap of what you’ll find on the Trails of History. All sites (except Washington Crossing) will be closed on Dec. 25. Most sites are closed on Mondays at this time of year, but Eckley Miners’ Village, Fort Pitt, Landis Valley Village & Farm Museum, and the Railroad Museum of Pennsylvania will be open on Dec. 26 for your visiting pleasure. Given seasonal schedules, I highly recommend checking ahead with the site you want to visit to see if they’ll be open when you plan to be there. First of all, thanks to the folks at the Anthracite Heritage Museum and Scranton Iron Furnaces for sharing the photo above. As part of the Museum's annual board, staff, and volunteer luncheon, everyone brought a gift for Toys for Tots. The collected goodies were delivered to the U.S. Marine Corps Sub District Recruiting Station in Scranton. Curator John Fielding is shown here with two Marines and several of the new toys collected. I'll also mention that other sites also mix community service with their holiday programs (if I've left out a site, please let me know)--Landis Valley collects non-perishable food items as part of their community bonfire program; Erie Maritime's Christmas Tree ship program collects holiday decorations and scarves/gloves/hats for people who need them; and the Railroad Museum of PA serves as a collection point for Toys for Tots in their community. Thanks, all of you, for all you do. Dec. 27-30, Lantern Tours—special evening tours bring the site and its history to life; student historians work with staff to present this perennial favorite. The 2011 tour explores education in a variety of forms at the historic Ephrata Cloister. Reservations are required as the space in each time slot is limited. Call 717-733-6600. Flagship Niagara League graphic designer Tim McLaughlin has developed a paper model of Niagara that could be the perfect snowy day project. Click on Paper Niagara Directions, Paper Niagara Sail Plan, and Niagara Paper Ship for the pieces you'll need. If you're in the area, why not visit the ship before or after you build your own? Dec. 27 and 28, Winter Camp—help combat school break boredom by attending either or both days of this engaging program. Hands-on activities include open hearth cooking. Registration fee is required (multi-day, multiple child, and member discounts are available); call 717/569-0401 x228 for more details. If you prefer some armchair history, the staff of the State Archives has selected 15 episodes of Harrisburg broadcaster and historian Pete Wambach’s “This is Pennsylvania” radio program (which aired throughout the state from 1964 to 1985). These seasonal selections (you’ll need to scroll down the page) last about 3 minutes each and include transcriptions. Dec. 31, Last day to view the exhibit, Rail Traffic Control: Managing the Crossroads of Commerce. Dec. 29, Noon Year’s Eve—young children and their families can ring in the New Year a little early at this annual event. Included in museum admission; free to museum members. Dec. 25, Washington Crosses the Delaware—the annual reenactment of the daring move by George Washington and his troops to attack the garrison at Trenton; free of charge. Dec. 31, 235th Anniversary of the Crossing of the Delaware and the Battle of Trenton—this reenactment event takes troops from Washington Crossing, PA, (or they can join up on the NJ side of the Delaware) to the Old Barracks Museum in Trenton (on foot). Registration is required to participate (the public is invited to watch); go here for more information. And finally, here’s a YouTube clip from Ephrata Cloister’s Christmas at the Cloister program in 2009. Whatever holiday you’re celebrating, may it be filled with good things. As regular readers of Trailheads know, the PHMC's theme for 2011 has been William Penn's Legacy: Religious and Spiritual Diversity (previous posts have covered the theme here and here ). So as the year winds down, you have the opportunity to view two symposia sponsored by PHMC and the PA Humanities Council that explored aspects of Pennsylvania's religious heritage. Tomorrow night, December 22, PCN will show the two programs back to back: "William Penn’s Legacy: Does the Holy Experiment Continue?" will air at 7 pm, and "The Abundance of Sacred Places" will follow at 8:35 pm. ﻿ Gov. Tom Corbett and First Lady Susan Corbett announced earlier this month that the theme for this year’s decorations at their official residence would be “A Pennsylvania Christmas.” Two Trails of History sites are represented. The Erie Room features a Flagship Niagara Christmas tree, complete with “Don’t Give Up the Ship” flags. Staff from the Railroad Museum of Pennsylvania, as they have done for a number of years now, supplied and set up a model train layout around the Children’s Tree in the State Reception Room (pictured above). To see the Niagara tree and more photos of the Governor’s Residence decorations, visit the First Lady’s Facebook page here. Pennsbury Manor hosted another successful year of its Holly Nights program (a longstanding Bucks County favorite). More than 2,000 people attended the two-night event, enjoying traditional music, food, decorations, and food. Some visitors enjoyed it so much that they posted their own photos to Pennsbury’s Facebook page (see above). 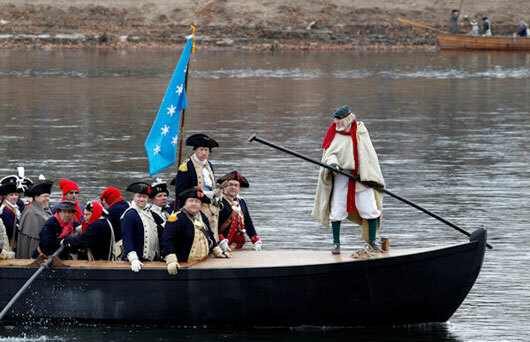 Although the Delaware River was pretty high last Sunday and it was not safe to row the durham boats over to New Jersey, all other aspects of the dress rehearsal for the annual Christmas crossing went ahead as planned. 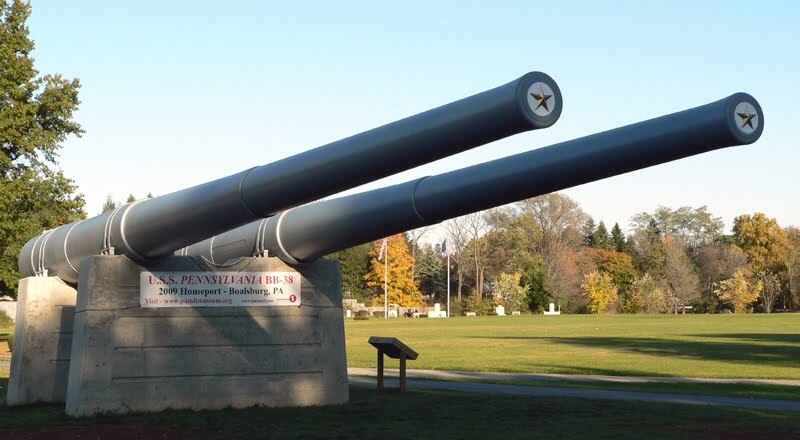 As you probably know, the event at Washington Crossing Historic Park commemorates the brave venture of Gen. George Washington and his troops on Christmas night 1776 that led to the first Battle of Trenton. The main (modern) event takes place at 1 p.m. on Dec. 25; even if the river doesn’t cooperate, there will be plenty to see. I realized as I was pulling this together that there’s a connecting thread to these items, besides the fact that they all involve Trails-of-History-related online resources. I don’t think it will be too difficult to spot, but the first commenter to point it out gets a free (value $0) subscription to Trailheads. As the bicentennial of the War of 1812 approaches, Battle of Lake Erie: Building the Fleet in the Wilderness, a booklet by Rear Adm. Denys W. Knoll, USN (Ret.) of Erie, is now available online, courtesy of the Naval History & Heritage Command and the Naval Historical Foundation. The Battle of Lake Erie and the US Brig Niagara’s pivotal role in it are key elements in any understanding of the War, and Knoll’s booklet provides a solid history. Having it available online will broaden its reach and help Erie Maritime Museum commemorate this important anniversary. Ephrata Cloister is featured in the "Properties and Preservation" section of the current issue of New England Antiques Journal. The illustrated article, by Barbara and Ken Beem, provides readers with a brief history of Conrad Beissel’s early life in Germany and migration to Pennsylvania, his attempt to settle himself away from civilization (one might even say “in the wilderness”), and the folks who followed him to what became Ephrata. Lovely publicity, just in time for Ephrata’s Lantern Tours at the end of the month. Well, here we are with another year drawing to a close. They say that time moves faster the older you get, but this is ridiculous. There’s so much to do. (Breathe.) I hope that in the midst of the busyness, you can spend some time on the Trails of History. As you probably know, site schedules really start to vary this time of year, so be kind to yourself and check ahead to make sure the site you want to visit will be open when you plan to be there. All sites (except Washington Crossing) will be closed on Dec. 25; but otherwise, there are lots of things to see and do. Enjoy. Dec. 3, 14th Annual Christmas in a Small Town (aka The Santa Train)—the Museum is a partner in this celebration that brings Santa to six communities in the Lackawanna Valley on a train provided by Steamtown National Historic Site. All activities are free, but (unfortunately) train rides for the public are not a feature of the program. For more info, go here. To see a YouTube video of the 2009 Santa Train (and watch the snow pile up), here’s a link. Dec. 3, Open House Holly Trail—the Friends of Conrad Weiser Homestead book store will be offering a great selection of books (10% off), along with painted boxes and chests by artisans Eleanor Sweeney and Jan Taylor. Dec. 3, 16th Annual Christmas at Cornwall House Tour—some tour entries are new this year, others may be ones you’ve missed. Purchase tickets in advance for $15, on the day of the tour for $20; contact the site for details. Dec. 4, A Homestead Christmas—scheduled activities include open hearth cooking, colonial music and dancing, tours of the Boone homestead and other historic buildings, a flintlock shoot, 18th-century crafts, and Belsnickel. Dec. 3, Children’s Christmas—storytelling, arts and crafts, a wagon ride through the Village and a visit from St. Nicholas; program is recommended for ages 5-12. Reservations are required (contact the site); admission is $5 per child, $3 per adult. Dec. 3-4 and 10-11, Victorian Christmas Fundraiser—the Sharpe House will be decorated and lit for the season, with Victorian ornaments and gifts (beverages and cookies will also be provided); admission is $5 for adults, $3 for children age 6-12. Dec. 12-13, Christmas at the Cloister—a popular evening program featuring readings and music in the historic meetinghouse; space is limited and reservations are required (tickets went on sale at the beginning of November, so call 717-733-6600 now to see if there are spaces remaining). Dec. 27-30, Lantern Tours—special evening tours bring the site and its history to life; student historians work with staff to present this perennial favorite. The 2011 tour explores education in a variety of forms at the Ephrata Cloister. Reservations are required as the space in each time slot is limited. Call 717-733-6600. Dec. 9, Christmas Tree Ship—learn the story of the schooner Rouse Simmons, which went down in a storm on Lake Michigan in 1912 carrying a load of Christmas trees. 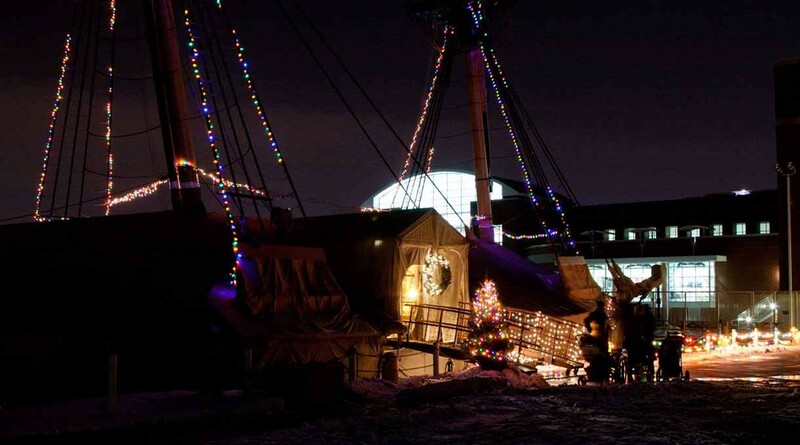 Enjoy holiday crafts, seasonal goodies, and lights on the rigging of Niagara. Bring along hats, scarves, mittens, and/or non-perishable food items to help local families (or contact the museum to find out about helping with a Christmas tree to donate). Dec. 3-4 and 10-11, Country Christmas Village—experience a Pennsylvania German Christmas while you learn about Christmas trees and traditional holiday foods. There will be craft activities for children and you may run into Belsnickel (he’s like Santa, but edgier). Included in museum admission. Dec. 16, Holidays at Landis Valley—this free evening event welcomes the community to sing carols around the bonfire, tour the historic buildings, and enjoy cookies and hot cider. Please bring non-perishable food items for the Lancaster Food Bank. Dec. 17, Old Fashioned Children’s Christmas—this year’s program is built around the theme “’Twas the Night Before Christmas” and includes several holiday crafts. Admission is charged, but members of the Landis Valley Associates get in free (makes a great holiday gift, too). Dec. 27 and 28, Winter Camp—combat school break boredom by attending either or both days of this engaging program. Hands-on activities include open hearth cooking. Registration fee is required (multi-day, multiple child, and member discounts are available); call 717/569-0401 x228 for more details. Dec. 3, Breakfast with Belsnickel—a breakfast buffet, plus loads of activities for children 5-12 years old (adults may enjoy a guided tour while the young ones take part in the program). Reservations required (fee is $25 per child), call 724/266-4500 x101. Dec. 4, Friends of Old Economy Village Annual Christmas Dinner—start with wine and hors d’oeuvre in the Granary, then dine by lantern light in the historic Feast Hall. For reservations ($60 for FOEV members, $65 for non-members), call 724/266-4500 x101. Dec. 10-11, Christmas at the Village—the site opens at 2 pm on Saturday and Sunday for a program of tours, music, and traditional German foods (there will be plenty of activities for children). Admission is charged. Dec. 1 and 2, Holly Nights—okay, so it’s already the second night, but if you hurry you can still make it. Candlelight, bonfires, carolers, and craft demonstrations (I think there’s some cider in there too) set the mood for a winter’s night (click here for a discount coupon). Dec. 10, Wreaths and Greens Workshop—learn how to turn evergreen boughs into a lovely wreath and how to care for evergreens in your home landscape. Registration is required (215/946-0400) and it’s BYOClippers. Dec. 7, Pearl Harbor Remembrance Day Tribute—this event marks the 70th anniversary of the Imperial Japanese Navy’s attack on the US Pacific Fleet in Hawaii and will take place beneath the guns of the USS Pennsylvania, which was docked at Pearl Harbor on Dec. 7, 1941. For your listening pleasure, the staff of the State Archives has selected 15 episodes of Harrisburg broadcaster and historian Pete Wambach’s “This is Pennsylvania” radio program (which aired throughout the state from 1964 to 1985). These seasonal selections (you’ll need to scroll down the page) last about 3 minutes each and include transcriptions. The piece titled “Snow Shovel Championship” features a 1976 downhill race near Ambridge and mentions Old Economy Village (the snow shovel race will celebrate its 49th year in January 2012). Who knew? Dec. 16, Little Elves Workshop—parents and grandparents are invited to bring children (ages 4 to 7) to the State Museum Store from 10 am to 2 pm to make a special holiday gift while the grownups shop. Fee charged; free to museum members. From noon to 6 pm that day, as part of “3rd in the Burg,” shoppers will find special offers on creative gifts and stocking stuffers (admission to Store is free). Dec. 17, Fatherhood and Family Holiday Celebration: Celebrating Kwanzaa & Christmas—offered in partnership with Nathaniel Gadsden’s Writers Wordshop, this community celebration features music, food, and much more. Free of charge. Dec. 11, Dress Rehearsal—reenactors will conduct a full run-through of the Christmas crossing of the Delaware, and there will be other activities on site as well in the historic buildings; admission is charged. Dec. 25, Washington Crosses the Delaware—the annual reenactment of the daring move by George Washington and his troops to attack the garrison at Trenton; free of charge. To find out about winning a spot in General Washington's Durham boat for the dress rehearsal or the Christmas crossing, go here. Dec. 31, 235th Anniversary of the Crossing of the Delaware and the Battle of Trenton—this reenactment event (which I believe is held only every 10 years or so) takes troops from Washington Crossing Historic Park (PA) to the Old Barracks Museum in Trenton (or they can join up on the New Jersey side of the Delaware). Registration is required to participate (the public is invited to watch); go here for more information.